Since I got a new camera for Christmas (thanks Ryan!) I can now show photos again! My mother-in-law asked me to make her a Christmas present instead of buying something for her. 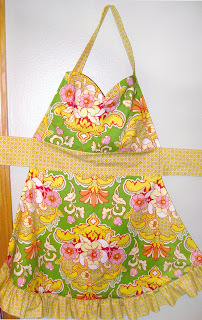 So I made this apron, and I am quite happy with it. The only thing I think I'd change is next time make the top a little narrower, and make the bottom a little more curved. The reverse side is dark red (I forgot to photograph that). It was fun to make and easier than expected.